This form is for instructors to schedule classes in the library. 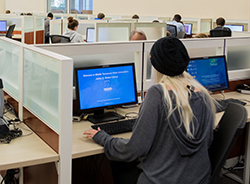 Students who need help using the library may contact us through our Ask Us! service. The Walker Library’s User Services Department offers librarian-led instruction sessions to support student learning at MTSU. Librarians can customize your library instruction lesson to support MT Engage or Experiential Learning classes, flipped classrooms, and Raider Learning Communities. Read about learning outcomes and assessment. All formal library instruction classes are conducted in Library Instruction Rooms 272 and 264A located on the second floor (see map). Twenty-eight computers are available in Room 272 and thirty-six in Room 264A. Call 615-904-8530 if you have questions. Notification of one week or more is required for scheduling general instruction classes. Classes are scheduled on a first come, first served basis according to room and library faculty availability. Instructors are requested to attend the library instruction session.